This heart warming soup is satisfyingly rich and creamy despite containing little fat. 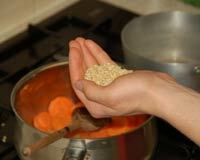 The key to this low GI soup recipe is the added barley which not only adds a delicious flavor but also reduces the GI. A fabulous recipe for all weight watchers. 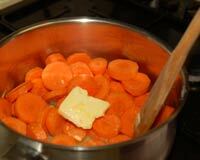 Slice the carrots and fry on a low heat with the butter. Add the salt, pepper and thyme. After a minute or two add the barley. I used about 2 large handfuls which was easier than weighing. 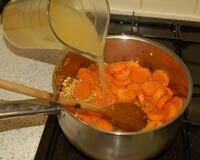 Continue to gently fry the carrots and barley for about 10 minutes. Add the vegetable stock, cover and simmer on a very low heat for 1 hour. I made the stock up from bouillon, but any vegetable stock cube or fresh stock can be used. 5 minutes before the cooking finishing cooking chop the celery and add it to the pan. When the 5 minutes are up put the whole lot in a blender or food processor and blend to a puree. 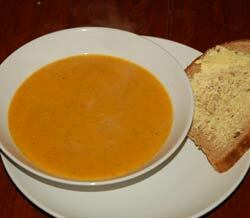 Serve this low GI soup with a slice of whole grain bread.